Boy, it sure feels good to finish projects and cross them off my list. This past weekend I was able to do just that. First thing off the list is the crochet hook case that my friend asked me to make for her. I think it turned out well. 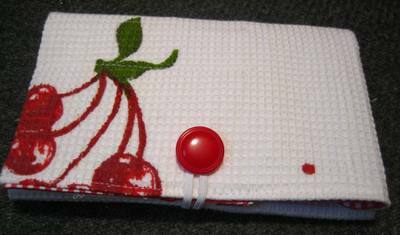 After my first failed attempt it had to - I didn't have any more of that cherry fabric, which started it's life as a dish towel. I hope she likes it. 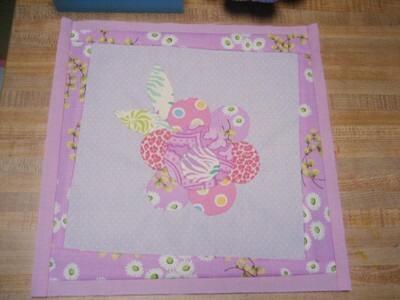 Next thing completed was my quilt square for the Kim's quilt. I was assigned to make a square for Sabine in pink. I decided to do an applique flower, my favorite thing. Instead of my usual quick and easy raw edge technique, I went with hand stitched applique, which is why it's kind of wonky. I really wanted the human element to shine through. It was a joy to lay in bed in the evenings to stitch this up. Hand sewing is very relaxing to me. In the end, my square ended up being a bit too small, so I had to add an additional border. There was no way I was going to hand stitch another applique!! 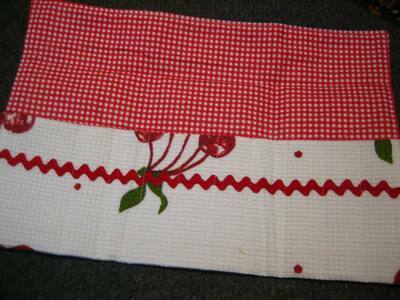 I'm not sure how that little border will translate once it's pieced with the other squares, but it'll have to do. I can't wait to see these quilts assembled. 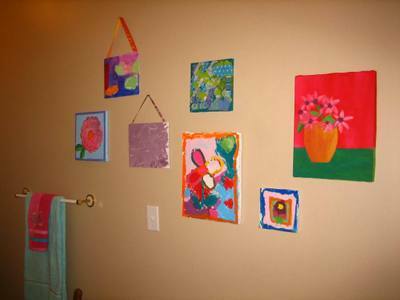 Because today is Thursday, Corners of my Home day, here is a picture of our "gallery" complete with the new art work, yet another finished project. This wall also qualifies as a WIP because I have plans to paint this room. I'm thinking of going with a light pumpkin color. One day I'll get around to that. Thanks for all your comments on my last post! It looks like I'll be able to give a nice little donation to the charity. I'll take a grand total after the weekend and let you know then how much it ends up being. Thanks again!! !